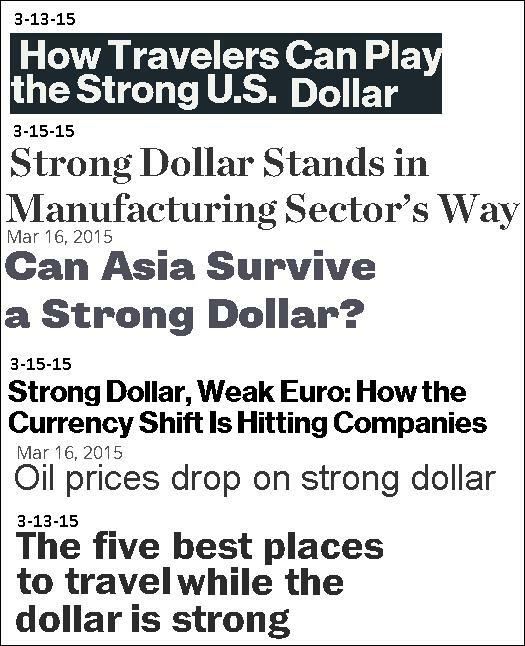 The “Strong Dollar” is seemingly the only headline in the media right now…and it is EVERYWHERE. Everybody understands that market tops and bottoms occur precisely when the whole world is on one side of a market. 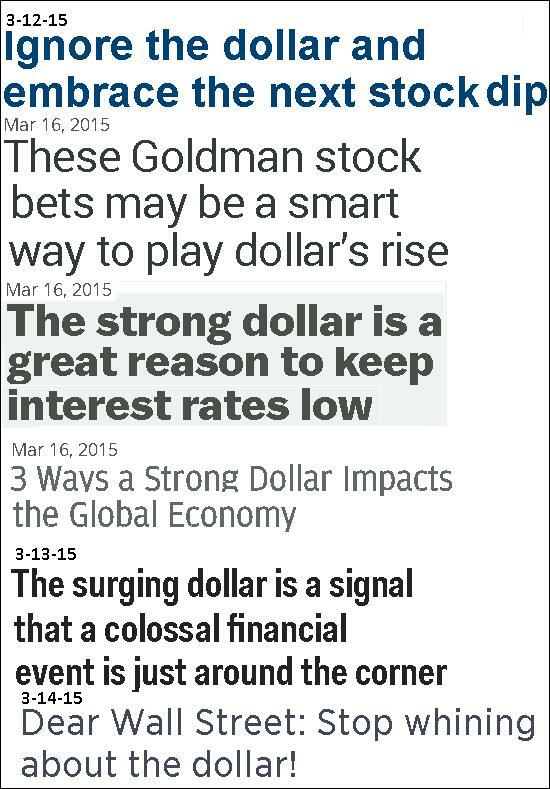 The best trades are the ones that NOBODY wants any part of…which is one of facets of this business that can make it so difficult…When EVERY headline on the planet is shouting “Strong Dollar!”, it is nigh on impossible to convince people to go the other direction. BUT THAT IS WHAT YOU ARE SUPPOSED TO DO…and this has nothing to do with having brass testicles…or being willing to step in front of a freight train…or any other euphemisms for bravery/insanity in trading. 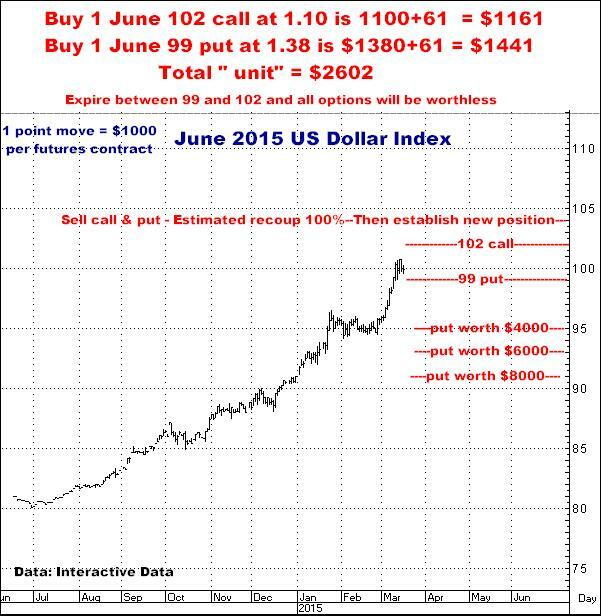 SELLING THE DOLLAR HERE IS JUST SMART TRADING. It’s no different than Mr. Buffet understanding that you do buy stocks when there is blood on the tracks and everybody hates the market. As I have written over and over, how many times do you have to see this stage of the investment game to understand what to do with it? I actually started buying the Euro in January, and losing, but February 5th is when I first officially started recommending Selling the Dollar and/or Buying the Eurocurrency. Since then both markets have moved sharply against me but this has only increased my desire to be in this trade, particularly after uncovering several critical developments which have taken place during the past 2 weeks. Players getting in and out is what moves markets. Tops generally occur when all the buyers who ever would buy…HAVE BOUGHT. Once there are “no more buyers”, the market has only one way to go, and that is DOWN as all those buyers then have only one option left…TO SELL. The Dollar started its current rally last July, or about 7 months ago…And 7 months ago, there essentially wasn’t a headline anywhere on the planet suggesting a rally was coming. Now, as noted above, it’s a totally different story. 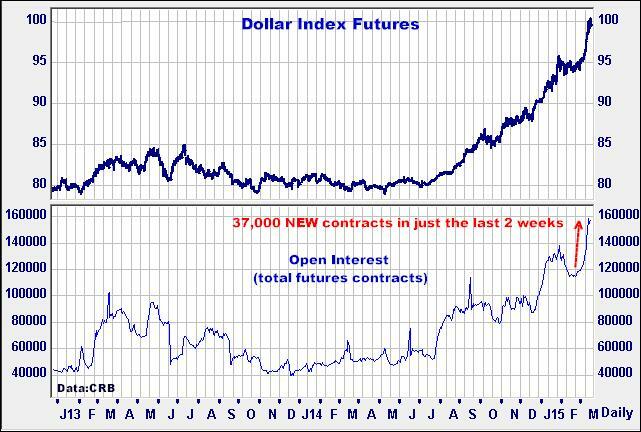 EVERYBODY IS ON THE DOLLAR BAND WAGON…and with the influence of all those NOW occurring Strong Dollar headlines…during the past 2 weeks (NOT 7 months ago), as can be seen on the chart following, speculators have been more or less STAMPEDING IN as buyers in the Dollar Index. Take a look at the lower half of this chart…far right…and keep in mind…PEOPLE GET IN…AND THEN THEY HAVE TO GET OUT. Ok…I know the “squiggly lines” may mean more to me than they do to you but this is the bottom line: In the past 10 trading days, the number of contracts held in this market has jumped by 37,153 contracts, which translates into a 31% increase. . In other words a TON OF SPECULATORS HAVE ENTERED THIS MARKET DURING THE FIRST TWO WEEKS OF MARCH...and I don't think you need to be a market guru to KNOW they were all jumping...QUITE, QUITE late...on the "Strong Dollar" band wagon…And if my perception of the markets are worth anything at all, I’ll suggest they are ALL going to be losing BIG…and losing SOON. 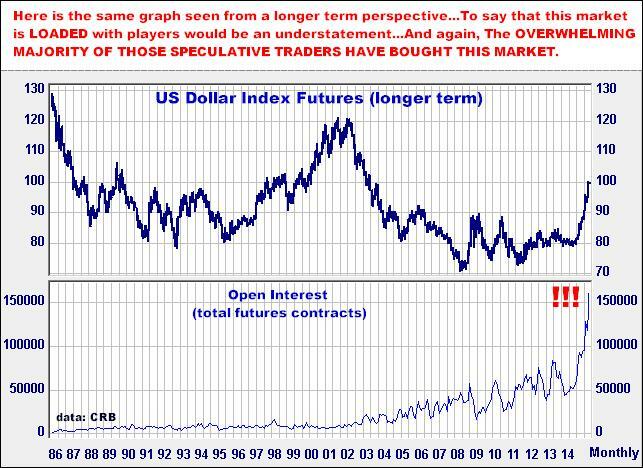 I think this market is absolutely STUFFED with longs and there is nowhere else to go from here but DOWN…and if past Dollar tops are any guide at all, the downturn will be more like a collapse than a slow slide lower. Generally, when you get super high volume in a market that has been decidedly on the move, more often than not it represents a definitive signal the market has gone as far as it can go. The high volume of contracts traded, measured on a daily or weekly basis, is most likely generated by three separate types of transactions: Shorts getting out (buying), Shorts getting out and going long (more buying), and New Longs getting in (LOTS more buying, as indicated by the giant increase in open interest since March 1)…And all of it adds up to what is often defined as CLIMAX VOLUME…or an avalanche of daily or weekly volume (last Thursday was the biggest single volume day ever) that potentially indicates the move is over…There are no more buyers to buy…and all the shorts have had it run up their yin yang…and want no more. And this is when you get short. 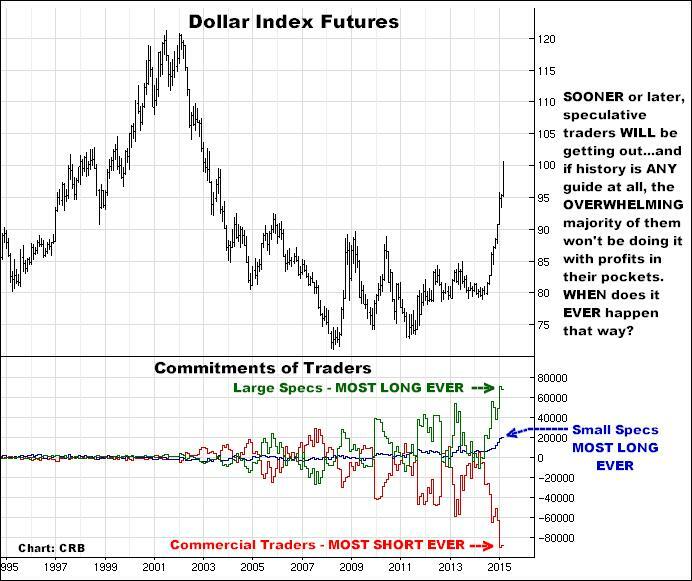 When the shorts have run…and the buyers have hit historical “overload” levels…And no, there is nothing absolute about what I have outlined here, but to me, these ARE two major important internal indicators that DO suggest the timing right now is perfect…which DOES perfectly dovetail with all those “Strong Dollar” headlines that ARE EVERYWHERE right now. I RECOMMEND SHORTING THE DOLLAR HERE, AND THE SOONER THE BETTER, AS THE CURRENCIES DO HAVE A TENDENCY TO MAKE QUITE SHARP TURNS. As always, timing is everything in this business, and I absolutely think the time is now. As always, maybe I’m wrong, which can mean losing whatever you invest, but I am more than willing to put my money on this idea. 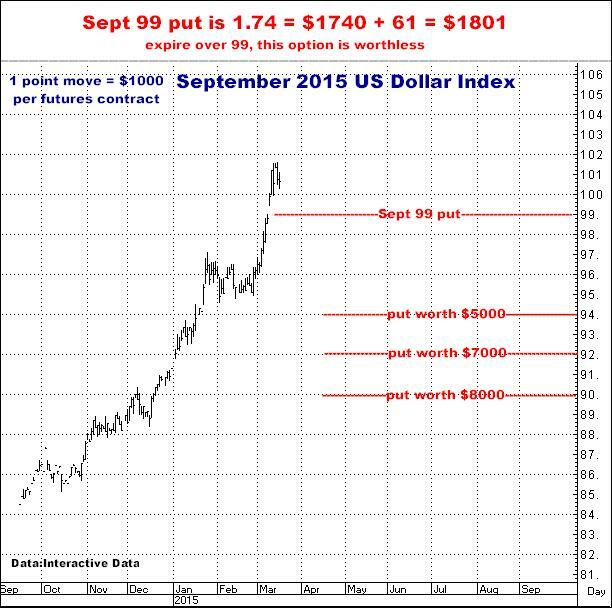 All option recommendations in this newsletter include all fees and commissions. I’m tired and ready to just get this thing out, but before I do, I want to say that several weeks ago I kind of stumbled into a different attitude, and approach, regarding the Both Sides Strategy (awful name I know) that I have recommended for decades. Without going into detail ( I intend to do so soon in another newsletter) I concluded that an idea I have rejected for YEARS as “not having enough leverage”, was, in fact, probably superior to the “2 & 1 Unit” that has been my mainstay since I first began using options approximately 30 years ago…Simply stated, going forward, there is a time and place for the 2 & 1, but MY PREFERRED STRATEGY WILL BE TO BUY “UNITS” OF 1 CALL AND 1 PUT. I will not be doing this “1 & 1” with the idea being, “ I don’t care which way the market goes”. I will still be taking positions with a definite opinion as to the next big move in a market, and one side of the position will still be viewed as my “defense”, or my “insurance”. As such, I will still be using that side of the trade as a means towards recovering 100% of what has been spent on the 1 & 1 if the market goes the wrong way…which, if compared to the old 2 & 1, from a purely mathematical standpoint, should make it much easier to recoup that 100% ( by selling both options)…and thus, also make it much easier to take the same amount of money and reposition at better levels…On the flip side, if the market goes in the direction I am predicting, my objective will be the same as it always was with the 2 & 1…that being…Hold on and let it go. As I said, I’ve got an entire newsletter that I would like to devote to the pro’s and con’s of the old way, and this new one, but I’ll just leave it hanging for now, except to say this…The 1 & 1 more favorably impacts what happens when you are wrong in the markets…and DOES still offer MORE than enough leverage when you are right. 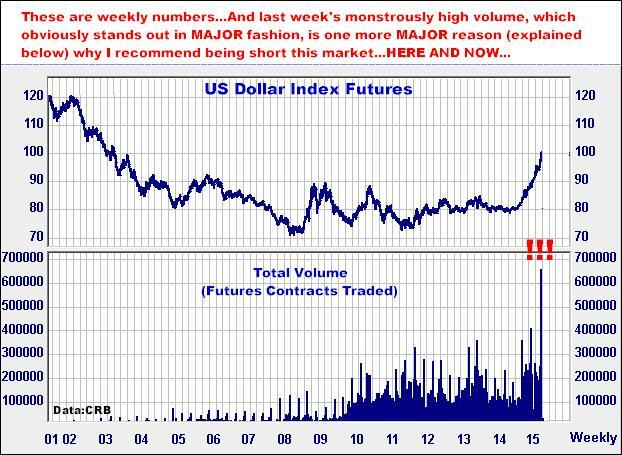 By the numbers…If the Dollar comes off just 10% to the 91 level...not a big move in futures…this 1 & 1 could hit for about a triple. And that, to me, is plenty of leverage. MY OPINION: THE DOLLAR IS going down. I will use this approach to be sure I can be there when it does. Give me a call…If you currently have the risk capital, and you don’t see the merit, logic and potential in this trade, I’d suggest you contact me and have your name taken off my list. I really can’t imagine EVER getting a trade that lined up better than this. Thanks…Really. Pick up the phone if you are interested…Doing the research, and then writing this stuff, is pretty much all I have the energy for.